South Mississippi Art Association participates in displaying art in various businesses and galleries in downtown Hattiesburg. I hung 20 pieces in 206 Front, a popular restaurant, along with another artist, Bernadette Birzer. Her works are large mixed media canvases, and mine are all fiber art, giving a wide variety of techniques and styles. These works will hang for the months of June, July, and August. 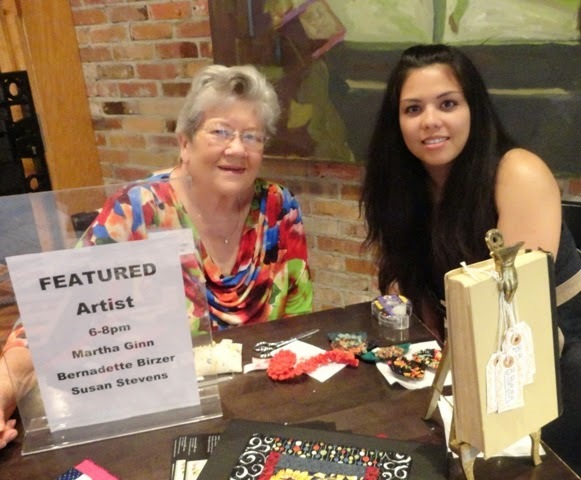 Bernadette and I were present at Art Walk on Saturday, May 31. 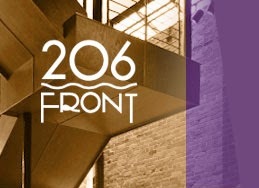 Quoting from their website: "Located in historic downtown Hattiesburg, 206 Front offers gourmet dining in a vibrant, urban setting. The menu is equally eclectic, fusing classic Italian with creole, cajun, and new American cooking." 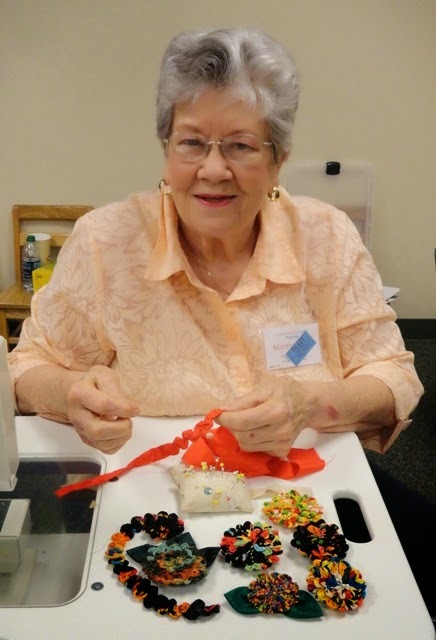 Our state quilt association--Mississippi Quilt Association (MQA) has a workshop meeting called the June Gathering every year. This year, it occurred on May 30-31. 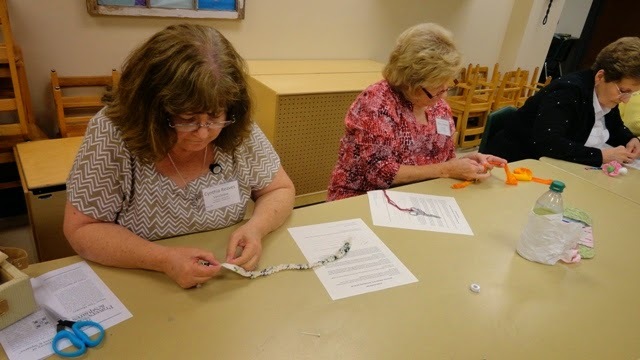 I taught a Friday night class on making Ruched Flower Pins and took Joan Alliston's Migrating Geese class on Saturday. Quite a full weekend! 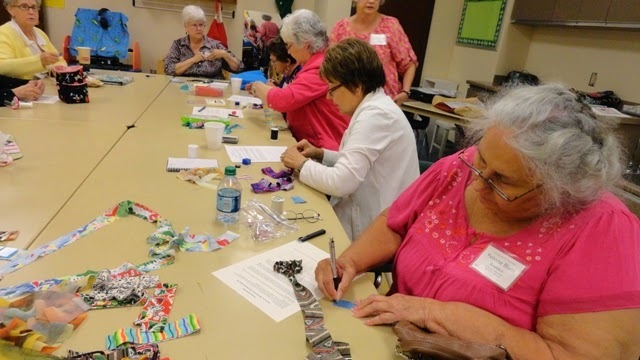 Seven members of my guild, Pine Belt Quilters, traveled from Hattiesburg about 90 miles to Brookhaven this week to share our quilting with the Brookhaven Piecemakers Guild. 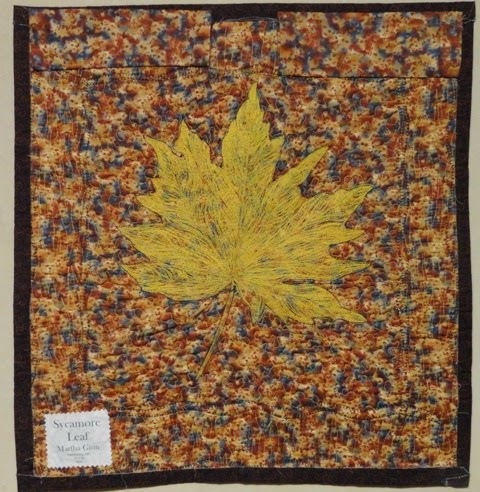 Some of their members had visited us last fall with their beautiful quilts, and we were returning the favor. It's always difficult to decide "what represents me?" and "what will they most enjoy seeing?" Since I had visited the group a couple of months ago to show my art quilts, I took some that represent my journey from traditional to art quilter. This seldom seen quilt is a sampler of quilt patterns executed in 14-count Aida using 6 strands of floss, with each X crossing two squares in each direction. 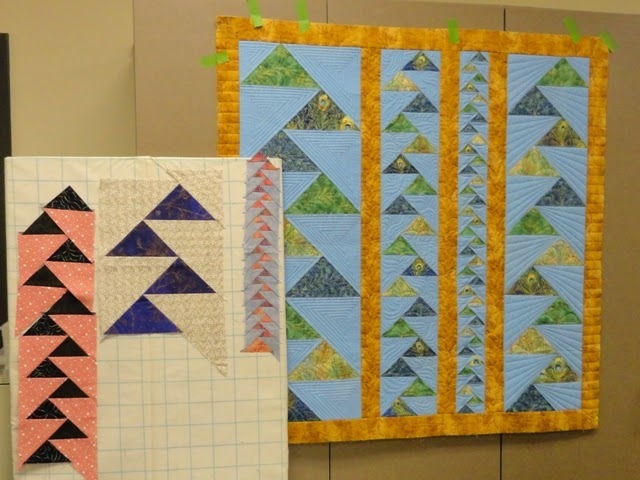 Daughter Linda and I started the blocks in the early 80s and I quickly saw that they were too pretty for a "non-quilter" to attempt, so I became a quilter and never looked back. She and I hand-quilted it and it won blue ribbons in two shows. Neither of us can display it as long as we have cats. One of the ladies quickly volunteered, "I don't have cats." When I won our guild's 12" friendship blocks in a basket pattern, I put them in a box. Later when another member won the variously sized tree blocks and was not happy about sewing them together, I worked out a trade with her. It was so much fun to design a huge tree containing these 26 blocks, adding one large block I had left from another project. The sky and grass background sections were made of Log Cabin blocks. I added small green frames around each block and found a perfect print for the leafy areas between the blocks. Figuring out the size and shape of these leafy areas was a delightful challenge. 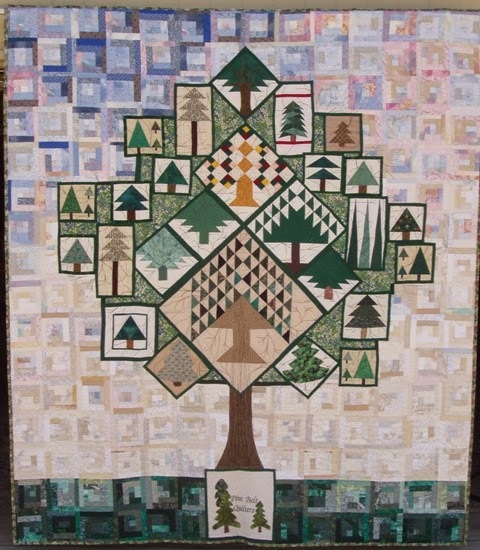 Friendshp Tree, 2005, 80" x 91"
A friend let me quilt it on her longarm machine after I had tried a few of our guild's children's quilts. I quilted swirly clouds in the sky, changing thread colors as necessary, all the while with a friend directing me "up here, now over here, go left, come this way" as I drove the machine. Looking back, all the help I received gives a whole new meaning to "friendship tree." I really love thread-painting, and this piece contains that and some other techniques. It started out as thickened dyes on white fabric. After dyeing the leaf design, I wanted stronger colors and thread-painting was the perfect solution to enhance the design. A curvy inner border helped disguise the pulling caused by the heavy stitching; the edge was finished with a curved binding, also fused. 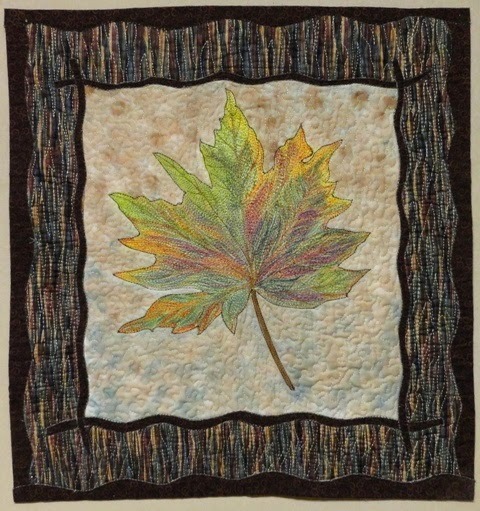 Sycamore Leaf, 2009, 19" x 20"
I also showed Migration and Galaxy, which use Caryl Bryer Fallert-Gentry's "appli-piecing" technique. Migration, 2011, 36.5" x 35"
Galaxy, 2010, 37" x 24"
I have posted pictures and more news about the trip on our guild's blog. 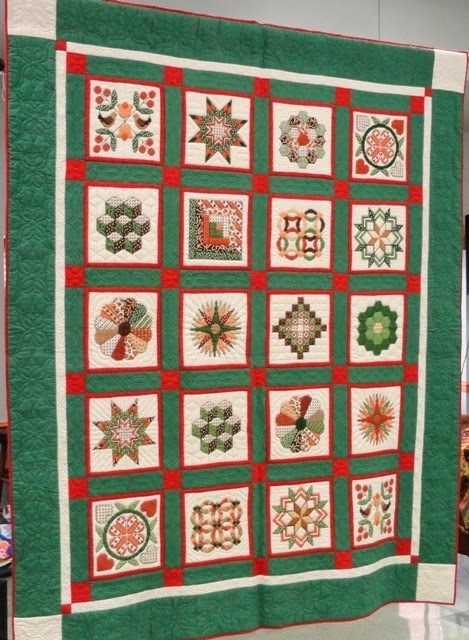 In all, we showed 50 quilts by 13 quilters. It was a fun trip, and the group treated us with a delicious spread of food.